This Demonstration considers nonisothermal chemical degradation of a labile compound, in which the temperature can vary with time . 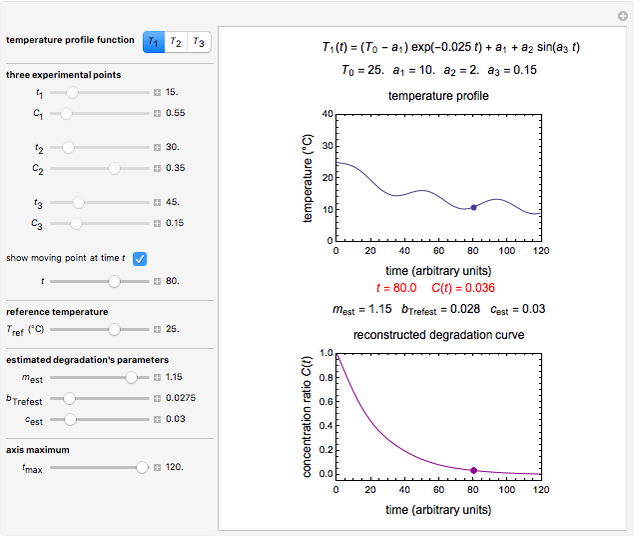 Under isothermal conditions ( ), the degradation follows a Weibullian model: , where is the time-dependent concentration ratio, , is a temperature-dependent rate parameter, and is a dimensionless temperature-independent curvature index ("shape factor"). An exponential model for the temperature dependence of the rate parameter is used, a simpler substitute for the Arrhenius equation, , where is the rate parameter at a reference temperature and a constant in units of reciprocal temperature. The decay pattern for is then described by an ordinary differential equation whose three parameters, , and can be estimated from three successive experimentally determined concentration ratios. These are subsequently used to predict the concentration ratio at different times under the same and/or different temperature histories. The concept is demonstrated with simulated storage under three different fluctuating temperature regimes. The three model parameters are obtained by selecting a degradation curve generated with the model for the specified temperature history through the three selected concentration ratios, using the mean squared error (MSE) as a guide and for fine tuning. Many, perhaps most, chemical degradation reactions follow first-order or other fixed-order kinetics. For these, if the kinetic order is known a priori, the other two kinetic parameters can be determined by the two successive points method . The concept can be extended to Weibullian chemical degradation and decay processes. 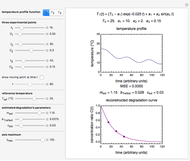 Nonisothermal ("dynamic") Weibullian decay can be described by the rate equation , where is the concentration ratio , is a temperature-dependent rate parameter, and is a dimensionless curvature index ("shape factor"). We assume that the rate parameter's temperature dependence follows the Arrhenius equation and hence the equivalent simpler exponential model , where is the rate constant at temperature , is the rate at reference temperature , and is a constant . In principle, for a temperature-independent curvature index and a nonisothermal temperature profile , expressed algebraically (or as an interpolation function), we can retrieve the values of , and and reconstruct the entire degradation curve from three known experimental points , and , from the solution of three simultaneous rate equations where the common boundary condition is . In these equations, , and are the concentration ratios at times , and that are entered with sliders. The right side of the equation is the numerical solution of the corresponding rate equations for the user-chosen . The three unknowns are , and . By moving the , and sliders you attempt to pass the reconstructed degradation/decay curve through the three entered points using the displayed mean squared error (MSE) as a guide and for fine tuning. When a visual match is reached, the sliders' positions can be treated as the corresponding parameters' estimated values. They can then be used to predict concentrations at different times under the same temperature profile or different profiles. If needed, they can also can be entered as initial guesses in FindRoot in order to increase their accuracy. This Demonstration illustrates the method using simulated storage data with three hypothetical fluctuating temperature regimes , and , where an If is included in the temperature profile equation . Other controls include the three points' coordinates, the chosen reference temperature between 15 and 30 °C, the maximum value of the time axis and a checkbox with a time slider to display a moving point on the reconstructed degradation curve . The top plot shows the selected temperature profile plot and its equation. The bottom plot shows the three points marked as filled circles and the reconstructed degradation curve created with the displayed values of , and . Note that, for the method to work, the entered points must be sufficiently far apart and the difference in the concentration ratios sufficiently large. Also, note that not all entered point triplets allowed by the program can be matched with a reconstructed degradation curve. If the inability to find a match occurs, it indicates that the reaction/process does not follow the assumed Weibullian model and/or that there is a significant error in one or more of the experimental points. M. Peleg and M. D. Normand, "Predicting Chemical Degradation during Storage from Two Successive Concentration Ratios: Theoretical Investigation," Food Research International, 75, 2015 pp. 174–181. doi:10.1016/j.foodres.2015.06.005. Mark D. Normandand Micha Peleg "Successive Three-Point Method for Weibullian Chemical Degradation"